Unlike yesterday, the weather wasn’t good this morning and the rain started heavily at 7 am. Thankfully the first trip carrying 4 orangutans arrived in Batikap at 11:30 am, but at that point the pilot was unsure whether he could manage the second trip or not. 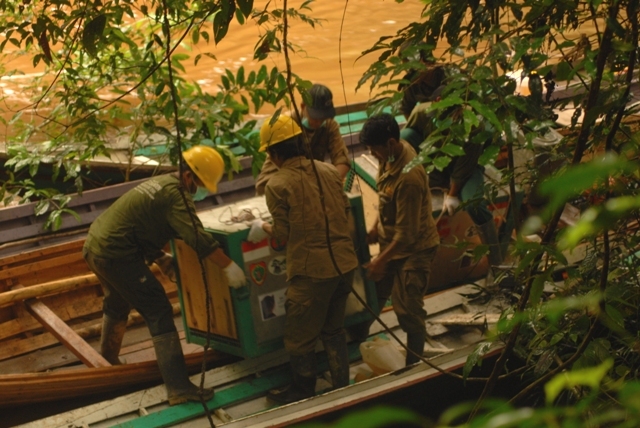 Since it was not clear if or when the second group of orangutans would arrive that day, the team worked efficiently, organizing themselves to ensure a team would be present at the helipad in case the helicopter could return with the second group. But for the time being we concentrated on the orangutans who had arrived and transported Isis, Mogok, Lesta and Lewis, and Dagoy and Debby to their pre-selected release sites. Isis was first and after the travel cage was opened, she looked around at the team then climbed 1 to 2 m up a tree before pausing, and again looked at everyone close by. Later, the post-release monitoring team followed Isis who did not kiss squeak or interact with the monitoring team. Isis stayed near the release point feeding for an hour on Pampaning fruits and made a nest in this tree as well. She spent some time with Lesta in the same tree but these females did not interact. Mogok also approached Isis, however she did not follow him deeper into the forest. Mogok also took some time to observe the monitoring team after his cage was opened and it took some time before he climbed the tree and started to travel. He was found about 150m from release location still travelling and feeding on Ruas fruits, but also snacking on young leaves and other fruits. He did not kiss squeak or approach the monitoring team. Mogok stayed near the river and did not make a nest until after 5pm. 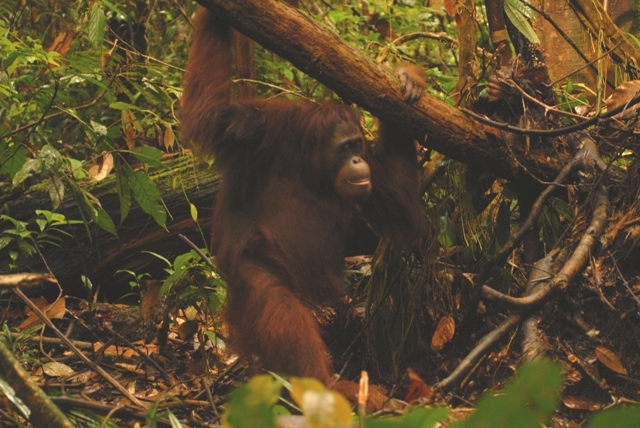 Once Lesta’s cage was opened she climbed a tree with her son Lewis and immediately started to travel. She was spotted together with Isis after release but soon took off and wandered deeper into the forest. Dagoy was an interesting case and as soon as her travel cage was opened, she did not climb a tree, instead she walked fast along the ground and forced the nearby monitoring team to move away and go back to boats. Dagoy did not continue to the boat and walked further north. The post-release monitoring team immediately started following Dagoy, but she tried to approach them and forced them to move away. The team returned and were able to follow Dagoy for a further 25 minutes. 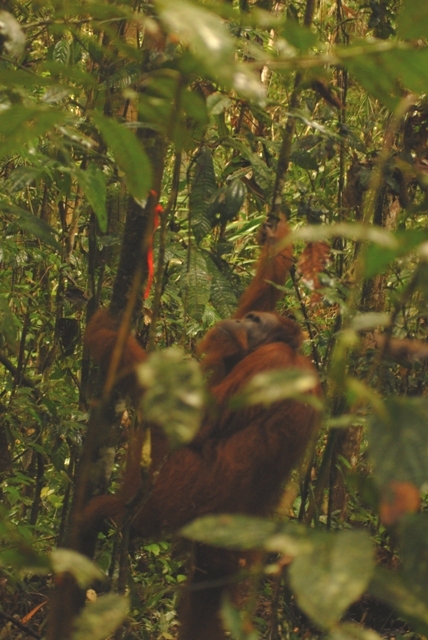 Overall all the orangutans were in good condition when they were released, active, and immediately eating wild foods. 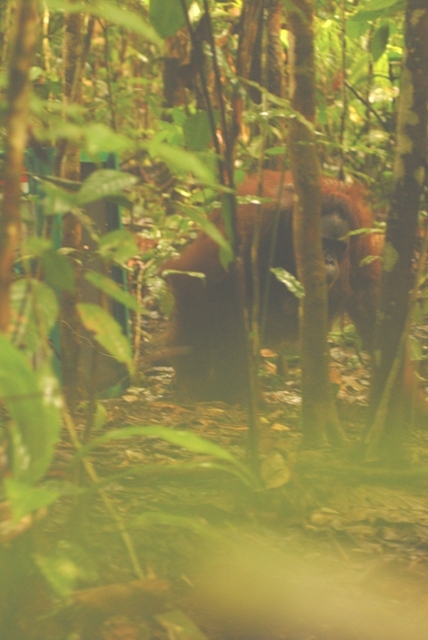 Dagoy may be very difficult to follow in the future but the post-release monitoring team will keep observing her, just like the other released orangutans to make sure they are coping well with their new environment. Can you clarify what happened with Dagoy? Was she acting aggressively towards the team, or was she trying to be with human company (thus jeopardizing her adaptation to the wild)? Also, was Debby with Dagoy all this time?